The county cross country championships herald the start of the championship season. Local club Liverpool Pembroke Sefton straddles the boundaries of Merseyside and Lancashire and has interest in both. The Lancashire titles were decided at Blackburn`s Witton Park and international Courtney Birch, now at Oxford University, finished third in the Senior Women`s race. Elsewhere the club took two second team spots. Rob Stocks was inspired in the Under 17 race finishing second and leading Chris Melling(11) and David Wilkie(12) to the rostrum for silver medals. This feat was repeated in the Under 15`s with Andrew Bowen(10), Sam Hutchinson(13), Rob McLaughlin(22) and Rob Bland(31) closing in. Solo competitors included Emma Bowen(13) at Under 13, Steph Swift(14) and Chris Watson(8) Junior Men. At Whiston the Merseyside Championships were fought out over a very muddy course. Although there was only one individual winner, Erin Halsall in the Under 17 Girls, there was plenty of success in other categories. The Under 20 men were particularly emphatic team winners led home by Ben Jones(2), Henry Stewart(3) and Mike Rimmer(5). Steve Doneghan(9) and Andrew Donaldson(10) were also in close attendance. Carl Williams individual bronze in the Under 17 race was replicated by a team medal with Mark Leicester(14), David Furlong(15) and Matt Brooks(20) providing appropriate support. Maria Barrett ran as solidly as ever to collect silver in the Under 20 Women`s race. The Senior men are still struggling to get the best squad out finishing fourth team but with excellent performances from Adam Clansey(12) and Steve Freeman(15). A number of LPS members can expect a call up for their respective counties for the Inter-County Championships in a few weeks time. It was 3-2-1 for Liverpool Pembroke Sefton`s youngsters at the Mid-Lancs Cross Country League match at Lancaster University. The Under 13 team of Matt Lloyd(15), Jason Ewell(22), Joshua Morris(24) and Daniel Barber(41) snatched 3rd spot but the Under 15 squad went one place better with Andrew Bowen(4), Sam Matthews(11), Joe McKenna(20) and Russell Irving. Meanwhile Andrew`s sister, Emma, was having an inspired sixth placing in the Under 13 Girls. It was left to the Under 17`s to collect an emphatic first team placing with Rob Stocks(2), Sam Williams(4) and Chris Melling(5). Burscough`s Rob Stocks is having an exceptionally fine season due entirely to hard training and a very positive attitude. Over at Clarke Garden`s in Allerton the Liverpool and District Senior Championships took place. The Seniors have struggled a bit the season but strengthened with some of the club`s promising Juniors Juniors showed signs of recovering their previous status. Led by Jimmy Boardman(7) and Adam Clansey(8) running in tandem and with Henry Stewart(15) and Steve Doneghan(16) repeating the same feat a little lower down the field they were in a position to claim the bronze medals. Steve Freeman(20) helped out but the truly astonishing performance came from 55 year old John Dobie(64) who closed in the team. It was his second medal in a week after taking a veterans award in the Merseyside County Championships. Ormskirk`s Phil Taylor, now at Loughborough University, opened his indoor season campaign at Sheffield in the North of England Under 20 Championships. The outdoor 400m champion chose the 200m this time and recorded a very sharp 22.65 to take the bronze medal. Kiera Vogel had a gold medal solo run in the U20 1500m but her 5.04 was only 3 seconds off the championship record. 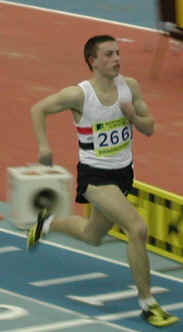 Elsewhere Liverpool Pembroke Sefton team mate Alex Stokes reached the U17 60m semi-final. Mark Grimshaw was also in form in the U20 400m recording 52.4 and reaching the final but opting to withdraw at that stage through injury. St Helens Sherdley Park was the venue for the North of England Cross Country Championships. The most outstanding performance of the Liverpool Pembroke Sefton club was Ben Jones silver medal performance in the Under 20 race. He was ably supported by Michael Rimmer(26), Steve Doneghan(44) and Dave Phillips(63) but the club was edged out of third team medals. The Under 17s suffered a similar team fate. Rob Stocks was as lively as ever in 19th spot followed by Carl Williams(31), Dave Wilkie(46) and Mark Leicester(490 with Chris Melling(68), Sam Glynn(70) and Matt Brooks(96) not too far adrift of the action but 4th team it as to be. The Under 15s were led home by Joe Nelson(43) and Skelmersdale`s Josh Morris(90) did the same for the Under 13s. The Senior men produced a surprise after a lean season by club standards. Jimmy Boardman was 44th and with Sammy Rashid(65), Steve Freeman(110), Adam Clansey(125), Greg Callaghan(265) and Luke Sanders(279) the critics were silenced as the club was a respectable 13th out of 60 teams.